I've made it to the next round of the ABC Family/Jane by Design Style Challenge! Thank you all SO much for your support. I can't thank you enough! Anyway, Challenge #4 was quite difficult but I think I pulled it off well. 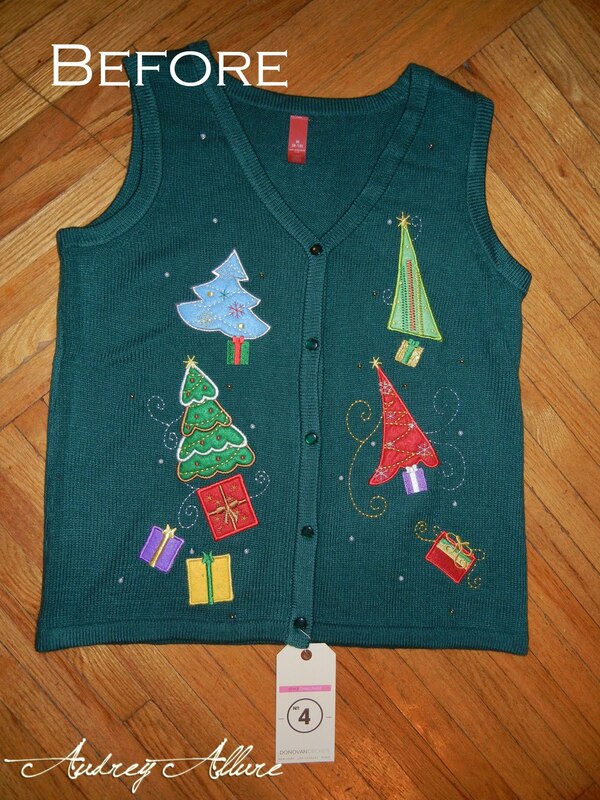 Task #4: "You must use every ounce of creativity you have to turn the holiday sweater into something special. Something spectacular. I don’t care if you use scissors or glue, your fat jeans or a slice of stale fruitcake. 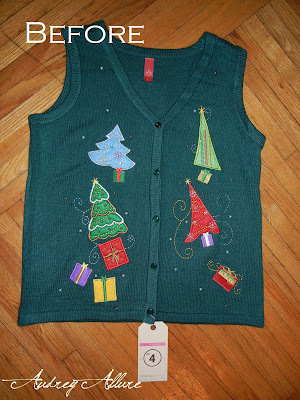 Turn that sweater into something fresh & exciting that could be the next big trend for Holiday 2012. 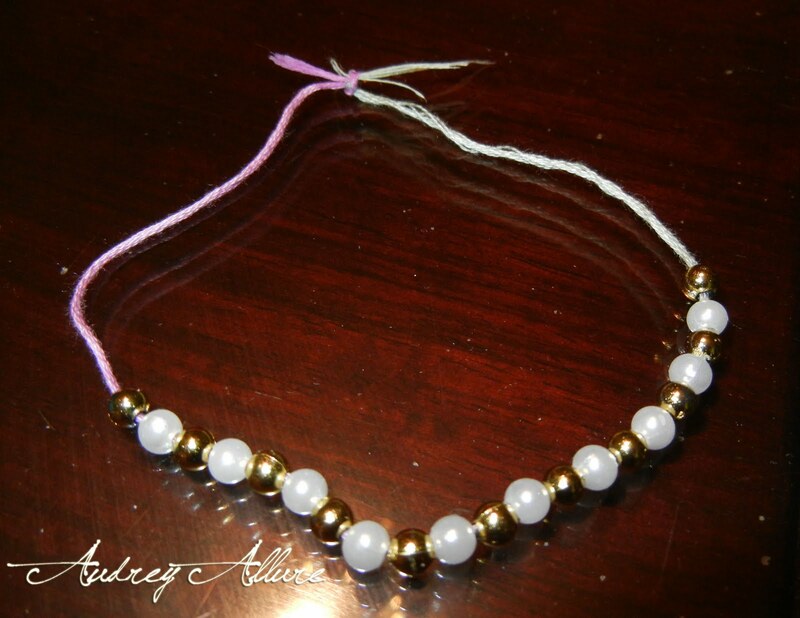 When you think you’ve created something innovative and amazing, whether it’s a bracelet or a mini skirt, post before and after photos to your blog, along with a step-by-step description of how you came up with your creation. Ask your readers to share their own inspired creations here and mention the name of your blog." I looked at the buttons and I thought the button idea would be a great idea for an opening for a small wallet. I've never made a wallet before so I basically winged the whole thing & below is my result. 1) I first took a small, basic wallet of my own (a two-fold), and used that as my measurement. 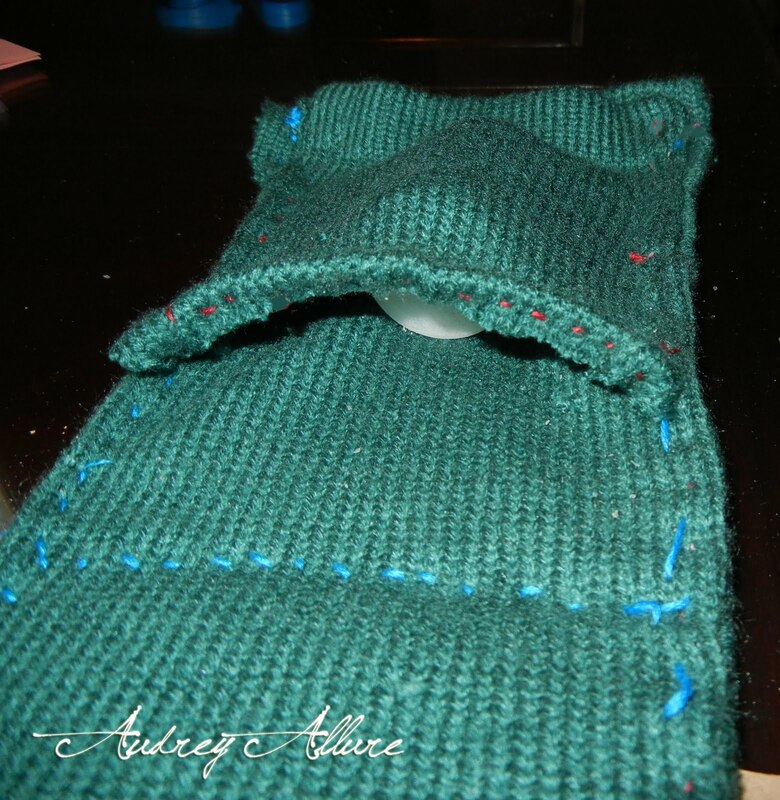 I used the back of the Christmas vest & traced the wallet open there -- leaving about a half inch around the perimeter. 2) Using that pattern, I traced an identical rectangle. 3) With the guiding of pins that held the two pieces together, I hand stitched one of the short sides. 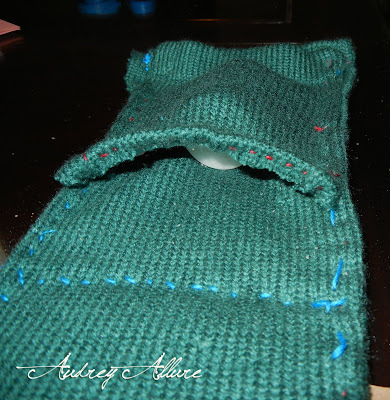 I then, stitched the bottom as well -- making sure you fold in the extra half inch in. (That way, the rough edges don't show.) I worked my way around & stitched the other short side. I tried making it more fun by using colored yarn. 5) I sewed the bottom half of the strip (where the button holes are) onto one end of the width of wallet, and did the same with the button strip on the other end. 6) I closed the wallet and measured where it would fold, and pinned it. 7) Measuring cardboard, I used two small rectangles and inserted it between the fabric, one for each side of the fold. 8) Again following the guiding of the pins holding it in place, I stitched the middle, and then eventually closed it off on top. Having the cardboard inside made the wallet sturdier and less flimsy. 9) Still needing a pocket, I decided to go with the one pocket sideways. I measured the fabric on the vest as needed & cut. 10) I hand stitched the pocket on 3 sides of it, leaving a nice opening. 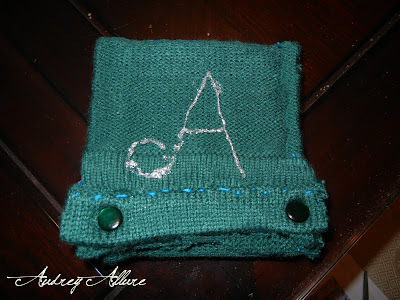 11) I finished it off by adding an"A" initial with fabric glitter. 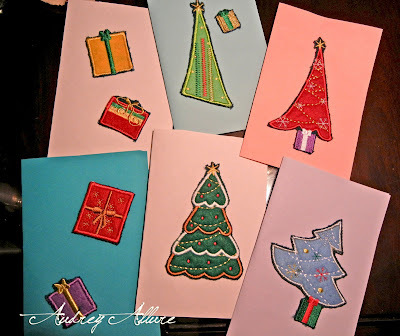 With the decals on the vest, I cut each one out & pasted them onto colored paper and cardstock -- they make great Christmas cards! Also, since collars are a great accessory right now, I thought I'd attempt my own. With the sweater vest fabric, this would be great for Holiday 2012 with a warmer feel. I measured about 1.5-2 inches of a strip of fabric - the length of it would be measured around your own neck and where you'd want it to connect. I stitched in the edges so the roughness wouldn't show, and since I didn't have any clasps, I used mine with a safety pin & it works just as great! OMG! This is so cool. You are so creative and definitely got your use out of this sweater. So cute! Congrats on getting to the next round! Such a fun post sweets! Wishing you a happy holiday and superb new year! Good job! I like the contrast stitching. It adds depth and fun to the wallet. beautiful creations! best of luck! 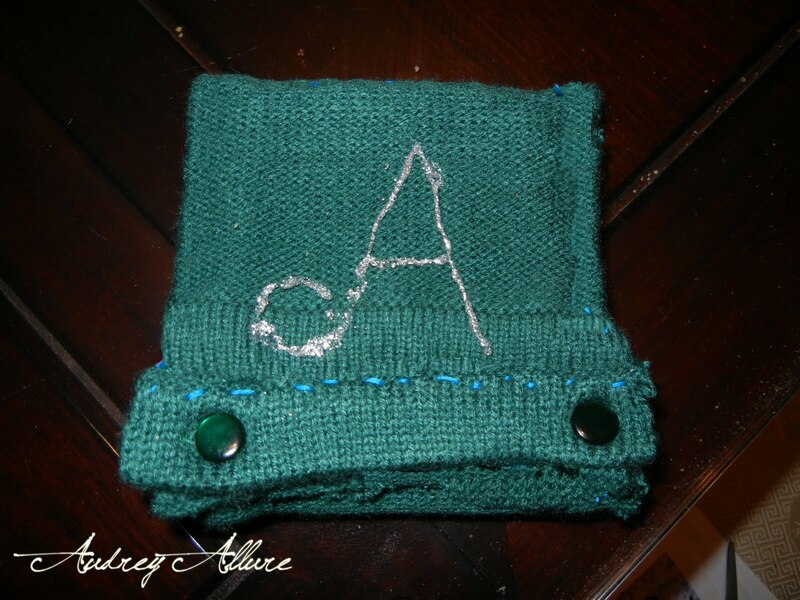 audrey ~ i just love your wallet and collar diy = gorgeous!! hope that you're having a wonderful holiday!! You are so damn creative girl! great recycling of an ugly vest!! i hope you had an amazing christmas. Amazing job! With that vest you have obtained a lot of nice things the wallet is my fave! Merry Xmas! its my first time at your blog and i really enjoy it! its really cute! Oh wooow, great yob! YOu really have an eye for beautiful things! Good job on the creativity and congratulations on making it to the next round. You nailed this - very creative! haha I'm curious just where you found that sweater. It is the epitome of ugly christmas sweaters! So great! 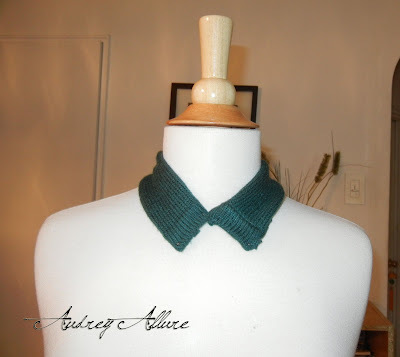 Love the collar idea! Def very trendy right now! Goood luck!